As I mentioned in my last post, I will now be taking a themed approach on Leadership Done Right. I decided that there isn’t any better theme to start with than “Change.” With the New Year upon us and New Year’s resolutions very prevalent, change is an appropriate subject. Change is a common word in the business world. However, it permeates all parts of life. Change occurs in government, healthcare, company structures, public education, family relations, etc. Change is so common that there is a saying that, “The one thing constant in life is change.” Change happens everywhere in every aspect of your life. 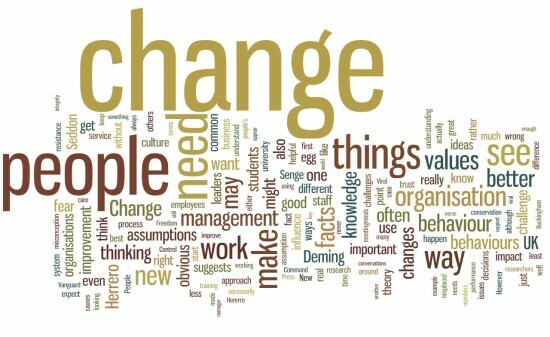 Because change is so prevalent, there are many aspects of change to consider. I will start by talking about the five aspects of change. There are three main drivers of change. They are people, technology, and information. I will write posts on each of the three drivers. In each post I will identify why it is a driver of change, how it affects you in your daily life and what things you can do to embrace changes caused by the driver. This is a question that many people in leadership ask on a regular basis. They wonder what it takes to get others to see and capture their vision. Before you can get people to change, it is important to understand where they are coming from and what fears they may have about change. When I discuss why people don’t change, I will identify three main reasons and discuss how those factors can affect you as a leader. People who face change have many misunderstandings on what change is and is not. They also have ideas about what they can do to stop or hinder change. Once you recognize the misunderstandings about change, you can identify when you have embraced the misunderstanding and when others around you are embracing it. That will help you to more effectively embrace change as well as get the buy-in from others. With each experience in life, there are opportunities to reflect. You can reflect on your own actions in addition to the actions of others. When outcomes are positive, you can implement the successes in your life. When outcomes are negative, you can make changes so they don’t happen again. I will talk about different things you can reflect on and identify how each will help you. Any time you make a change, it is important to follow steps so the change is implemented effectively. I will outline 10 steps you can take each time you implement a change so that the right people are involved and the change is implemented effectively. If any of the 10 steps are left out, it will be much more difficult to implement the effective change. I am really excited to start this new theme on Leadership Done Right and hope you will enjoy the posts as we go forward together. I would love to hear your thoughts on any of the points mentioned above. I would also love to hear your stories of times when changes you were involved with either went really well or really poor. Please share your thoughts in the comments section below!